Many years ago my Aunt Mary made cornish game hens for a holiday dinner- I am pretty sure it was Christmas. I was probably in early high school at the time. They were so good! I’ve wanted to make some ever since but I was also intimidated to try. Well, tonight I finally did! On a whim, I bought some at the store last night. I came home and consulted a cooking board that I regularly frequent for advice on how to make them and recipe recommendations. In the end, I didn’t follow an actual recipe or measure anything out. I brushed the hens with olive oil and seasoned them with kosher salt, pepper, minced garlic, oregano, thyme, basil, and paprika. I put water at the bottom of the roasting pan and added two teaspoons of onion soup because I didn’t have any chicken broth but wanted to add a little more flavor. I cooked them at 375 degrees until they reached a temperature of 180 degrees. They came out very well! My family enjoyed them and said I did a good job. (Although I am not sure if they were as good as I remember Aunt Mary’s being.) The paprika helped them brown nicely. They were very moist and tender. I put off making them for so long because most of the recipes I’d seen were kind of complicated. This was a very easy way to prepare them for the first time. I will try one of the recipes next time! 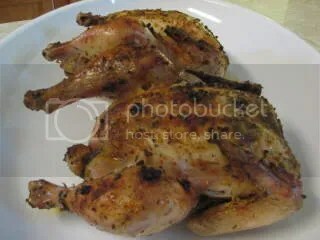 Roasted cornish game hens is one of those meals that intimidates me, but you make it sound so easy! They look delicious! I made cornish hens for a holiday dinner before. They are a refreshing change from the traditional turkey. I seasoned them with salt, pepper,garlic and paprika. and roasted them at about 375. I consulted a recipe book for wild rice stuffing which is great with these hens. Yours look delicious! It’s been so long since I made cornish hens, yours look great!